описание (rus) MobaXterm Pro представляет собой расширенный терминал с X server и набором команд Unix (GNU/Cygwin) упакованных в один портативный файл .exe. 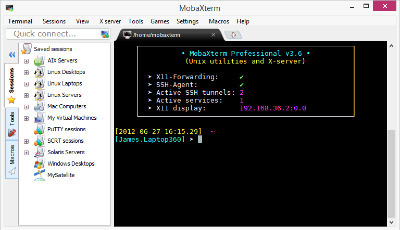 MobaXterm portable is your ultimate toolbox for remote computing. In a single Windows application, it provides loads of functions that are tailored for programmers, webmasters, IT administrators and pretty much all users who need to handle their remote jobs in a more simple fashion. There are many advantages of having an All-In-One network application for your remote tasks, e.g. when you use SSH to connect to a remote server, a graphical SFTP browser will automatically pop up in order to directly edit your remote files. Your remote applications will also display seamlessly on your Windows desktop using the embedded X server. You can download and use MobaXterm Home Edition for free. If you want to use it inside your company, you should consider subscribing to MobaXterm Professional Edition: this will give you access to much more features, professional support and "Customizer" software. When developing MobaXterm key, we focused on a simple aim: proposing an intuitive user interface in order for you to efficiently access remote servers through different networks or systems. MobaXterm is being actively developed and frequently updated by Mobatek. Bugfix: fixed the error message which occured when running the graphical package manager "MobApt"
Bugfix: fixed the "live-unpack" mechanism for local terminal plugins - some plugins were not working properly in "installed mode" or when using "persistent root"